In 2002-4, the FCO (in charge of the British Indian Ocean Territory – BIOT) decided that it was not feasible to carry out this resettlement. Mr Bancoult then started this judicial review. He said that there was an improper motive for the making of the MPA, namely a desire, once and for all, to get rid of the Chagossians’ claims for resettlement. The effect of this MPA is to ban commercial fishing, which was all they would have been able to survive on if they returned. So, Mr Bancoult said, this statement of effect of an MPA was a statement of motive for the MPA. The cable had emerged, it was said, from documents obtained allegedly by Private Bradley Manning from a US facility in Iraq. At an earlier stage of the proceedings, the Claimant had got a judgment from Stanley Burnton LJ s allowing them to cross-examine FCO officials including Mr Roberts on this document. The FCO had invited the judge to ignore the document, but solely on the ground that it had been unlawfully obtained. could, in principle, permit Her Majesty’s Government… to conceal an improper and unlawful motive for an executive act which is claimed to have had an adverse impact upon the rights of a significant number of individuals of Chagossian origin or descent. After the point was raised by the Court, the FCO’s barrister argued that s.6 of the Official Secrets Act 1989 prohibited the court from disallowing NCND. s.6 prohibits a “damaging disclosure” of confidential information. The cables contain confidential information, in that its contents had been communicated to US officials by British officials in confidence. The information bore on international relations, and arguably, on defence. Hence, its disclosure by any person in this claim would be an offence if it was damaging. This Convention was made part of UK law by the Diplomatic Privileges Act 1964. Hence, the FCO said, the cable could not be used in court. So the cable was excluded from evidence, albeit not before some preliminary questions had been asked about it. Later, on 31 March 2010, when the Foreign Secretary made the decision to go ahead immediately, the decision had nothing to do with Chagossian ambitions. The decision to override official advice can best be understood in the political context: Parliament was about to be dissolved. The Foreign Secretary no doubt believed that the decision would redound to the credit of the Government and, perhaps, to his own credit. It would do so the more if a decision with immediate effect was taken. Officials thought that this would create difficulties but it was the Foreign Secretary’s prerogative to override their reservations and make the decision which he did. There is simply no ground to suspect, let alone to believe or to find proved, that the Foreign Secretary was motivated by the improper purpose for which the claimant contends. Those circumstances would provide an unconvincing plot for a novel. They cannot found a finding for the claimant on this issue. The Claimant then said that the consultation was flawed. First, he said that it should have given a full account of a feasibility study (and its potential demerits) conducted into the possibility of the Chagossians being resettled. The Court said that this was all irrelevant to the consultation process. Secondly, he complained that the amount of environmental information in the consultation process was inadequate – but the Court responded out that the consultation was sufficient, not least because environmental considerations were strongly in favour of the MPA. The next ground is a rather tortuous if interesting tale; the consultation did not point out that the Mauritians had rights to fish in the waters subject to the MPA proposal. But those rights were themselves controversial. They dated back to 1965 (if not before) when the Secretary of State for the Colonies met Mauritian ministers. 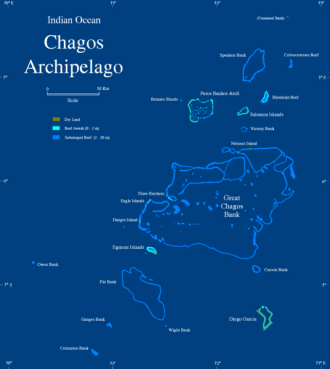 The Mauritians agreed to the detachment of the Chagos islands from the rest of Mauritius, on the understanding that the SoS would “recommend to his colleagues” that British Government would use its “good offices” with the US Government to ensure the availability for the Mauritian Government “as far as practicable” of fishing rights. Not the most robust of texts, but, despite this undertaking, the FCO view in recent times was that the Mauritians had no such fishing rights. The Claimant’s case was these rights (or at very least, these asserted rights) should have been flagged up in the consultation process, because they impacted upon whether an MPA should be declared. The FCO said that the consultation process made no reference to such fishing rights because it considered that the Mauritians had no such rights. The arrangements stemming from the 1965 agreement were political, not legal. But there was a further complication. The UK currently faces an international law challenge from Mauritius before the Permanent Arbitral Tribunal in the Hague under the 1982 UN Convention on the Law of the Sea. In this, Mauritius claims the MPA breaches its fishing rights under this Convention. The Court was therefore extremely wary of trespassing onto this international law territory. Indeed it said that it was wrong to make any ruling on Mauritian rights, one way or another, in proceedings to which Mauritius was not a party. It should also not say anything which might compromise the UK in those proceedings. Such an issue was, it concluded, non-justiciable: . Ultimately, it concluded that the consultation did not need to refer to these Mauritian claims. Mauritius had been claiming sovereignty over the islands (as distinct from fishing rights) and the sovereignty claim had been identified in the consultation papers. An EU issue arose in a case all about islands in the Indian Ocean. Tucked away in the Treaty on the Functioning of the European Union (TFEU – Art.198) is an agreement by member states to associate with other countries in the EU and territories with special relations with the UK – including BIOT. The purpose of the association was to promote the economic and social development and close economic relations. And Article 4(3) Treaty of European Union (TEU) obliges member states to refrain from any measure which could jeopardise the attainment of the EU’s objectives in its treaties. So relying on these and fishing evidence, it was submitted that the decision to create an MPA did the opposite of promoting economic and social development. The UK was in breach of this EU duty. However, this complaint had already been before the EU Commission which had rejected it. The FCO’s preliminary argument was that the Court should not reach any view counter to that of the Commission; the Claimant’s remedy should have been to seek annulment of the Commission decision in the EU Courts. The Court rejected this point. The caselaw relied upon arose in areas (competition etc) where the Commission had specific functions. Here, the Claimant was alleging that the UK was in breach of its Treaty obligations, and that was a matter for the courts, both domestic and EU. Further, an individual could rely on a breach of Article 4(3) if established – such a measure was sufficiently clear, precise and unconditional to be capable of giving rise to directly effective rights on which individuals can rely. But the Claimant lost at the final hurdle. The only measure in issue in these proceedings was the MPA, not the various steps taken to exclude the Chagossians from their islands. The MPA did not prohibit the return of a human population. If the MPA was lawfully made, then the UK was not in breach of Article 198 TFEU. There is a lot in this judgment for students of foreign policy, past and present, as well as for public and EU lawyers. But the finding which stands out is the refusal to allow the FCO witnesses to be cross-examined on the Wikileaks cable. This all turned on the meaning of “inviolable” in the Vienna Convention. Once the point emerged and the passage from Lord Bridge’s speech was identified, it was always going to be difficult to persuade a Divisional Court to ignore it. Whether a further appellate court will feel quite so constrained by this view remains to be seen. But on any view it raises deep issues – is it better to distort the trial process or uphold the confidentiality of leaked embassy documents at all costs?